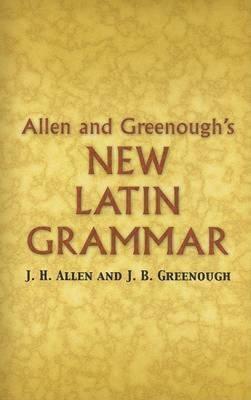 A venerable resource for more than a century, Allen and Greenough's New Latin Grammar is still regarded by students and teachers as the finest Latin reference grammar available. Concise, comprehensive, and well organized, it is unrivaled in depth and clarity, placing a wealth of advice on usage, vocabulary, diction, composition, and syntax within easy reach of Latin scholars at all levels. This sourcebook's three-part treatment starts with words and forms, covering parts of speech, declensions, and conjugations. The second part, syntax, explores cases, moods, and tenses. The concluding section offers information on archaic usages, Latin verse, and prose composition, among other subjects. Extensive appendixes feature a glossary of terms and indexes. Students of history, religion, and literature will find lasting value in this modestly priced edition of a classic guide to Latin.